Bike theft is nothing new in Los Angeles. A sound beating and bike theft at the point of a gun is. 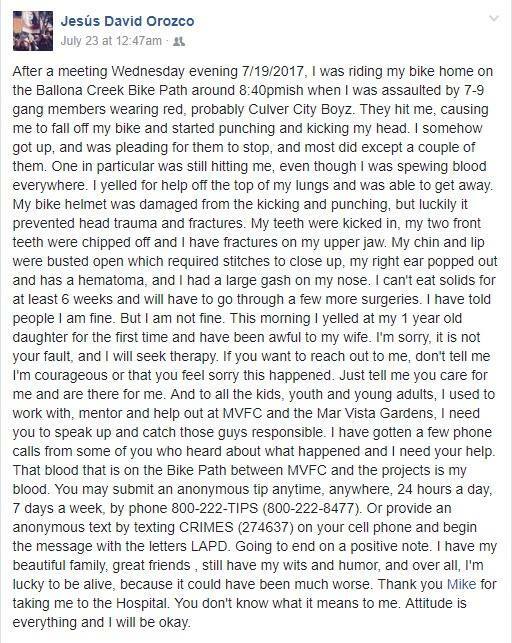 This morning I received the following email from Jane Voodikon, who wrote to warn LA bicyclists about the robbers who stole a bicycle from her friend Ulises Melgar Saturday night. 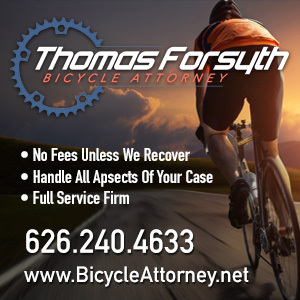 Today I’m writing to report to you an incident that happened to one of my biking friends this past weekend, hoping that you can help spread the word to the bicycling community. He was riding home Saturday night at around 11:30 p.m. coming out of the Little Tokyo area across the First Street Bridge eastbound toward Mariachi Plaza when a green four-door Chevrolet pickup cut him off and the passenger in the front seat pointed a gun at him and then tried to hit him with the gun. At this point he got off his bike, and then one of the men in the truck (there were five men total, wearing hats and sweatshirts around their faces) punched him, enabling the hijackers to take his bike, throw it in the truck bed, and drive off. It seemed they had planned this out because they had covered up the license plate with a trash bag. Unfortunately there was nobody else around to witness the crime, and at that location there would be no surveillance cameras. Understandably my friend didn’t react by taking a photo of the truck so there are really not many other identifying details. He reported it to the police, and they said they searched the area for a truck matching the description but found nothing. He said the truck bed was empty save for a construction toolbox. 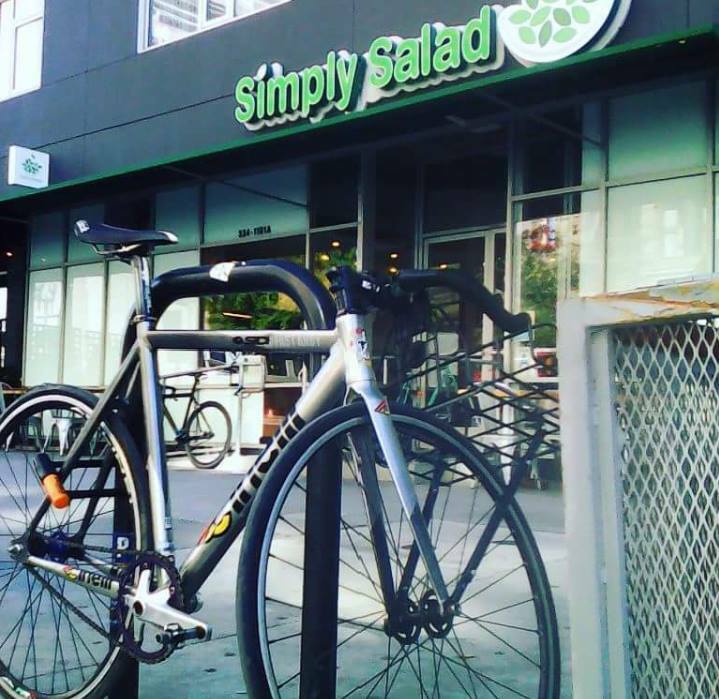 His bike is a 2012 silver Cinelli Mash frame, 52cm, with two noticeable dents on each side of the top tube. Fizik saddle, riser bars, platform pedals with Wellgo straps. Photos are attached. This is especially tough (apart from it being a terrifying and traumatic incident) because he has been getting back on his feet after being laid off last year. Since January he has been delivering food by bike for Simply Salad, UberEats, and Caviar. A friend has lent him a bike temporarily so he can continue to work but his bike is not only his property but also his transportation and most importantly his lifeline to income. 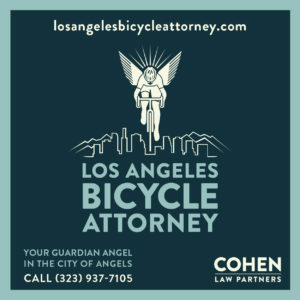 We’re hoping you can help at least alert the cycling public to the fact that there are people driving around hijacking bikes at gunpoint, and that is downright scary. She also reports that a friend saw someone riding the bicycle the night after the bike theft around Olympic and Normandie. You can contact Melgar directly through Facebook if you see the bike or have any information about the theft. Meanwhile, a crowdfunding campaign has been started in an effort to raise $800 to get him a new bike and gear so he can get rolling again and get back to work, but hadn’t received any donations as of this writing. As causes go, you could do a lot worse. Maybe we can help him get that first donation. Or maybe even put him over the top. Update: Good news! Ulises Melgar’s bike was recovered after being spotted in Hollenbeck Park; all he ended up losing were the lights and a Garmin. As a result, donations have been disabled on the GoFundMe page, and any who gave will be contacted about their donations. Peloton profiles SoCal’s own Coryn Rivera, who became the first American to win the Tour of Flanders earlier this year. Former Tour de France, Giro and Vuelta champ Alberto Contador announced his plans to retire after this year’s Vuelta. Next year’s Giro d’Italia will start just a tad outside the country, in Jerusalem’s Old City. Jillian Bearden will become the first transgendered woman to ride in a pro peloton when she takes part in Thursday’s Colorado Classic, setting a standard for trans athletes around the world; she credits bike racing with saving her life. The last two days of the Colorado Classic will be part bike race, and part music and lifestyle festival. A man riding a bicycle was the victim of a drive-by shooting in South LA early Monday; he was hospitalized in stable condition with bullet wound to one leg. The Daily Breeze looks forward to Sunday’s CicLAvia in San Pedro and Wilmington, though not all the local businesses seem to be on board. They may get a pleasant surprise if they reach out to participants, instead of closing their shops or turning their backs on the event. Competition kicked off in the 2017 World Police and Fire Games with a crit in Santa Clarita on Sunday, won by a 35-year old Cat 1 rider from the California Department of Corrections and Rehabilitation. Up to 1,000 people turned out for Santa Barbara’s annual unsanctioned Fiesta Cruiser Ride to Isla Vista and back. If the ride has been taking place every year since the 1970s, resulting in traffic citations and safety concerns, why not just make it official and control — if not close down — the route? Sad news from Kern County, where a man was killed in a collision while riding his bike on Edwards Air Force Base early Monday morning. The Hayward-based maker of Abba-Zaba, Big Hunk, Look, Rocky Road and U-No candy bars is one of us. San Francisco installs concrete K rails to upgrade an existing protected bike lane, which was previously marked with paint and plastic bollards, but does nothing to improve safety at dangerous intersections. Calbike released the schedule for October’s California Bike Summit in Sacramento. A new CyclingTips podcast tackles the question of whether ebikes belong on singletrack trails. The Department of DIY strikes in Spokane WA, as someone reinstalled a bike lane the city had moved to the opposite side of the street. An Idaho man is training to compete in the Hawaii Iron Man triathlon, 23 years after he was paralyzed from the neck down. A small Denver composting company is using a bicycle and trailer to collect food waste from restaurants and apartment buildings. Thirty bicyclists take a ride through Dallas in their underwear. Next year, they should be able to do it on their choice of three dockless bikeshare providers. Kindhearted Ohio sheriff’s deputies pitch in to buy a new bicycle for a young man, after the bike he used to ride to work couldn’t be repaired. Caught on video: A compilation of footage from a Tennessee security cam clearly illustrates the dangers of riding across railroad tracks, even when there aren’t any trains around. The battle over lane reductions and parking-protected bike lanes moves east, as residents and business owner in Cambridge, Massachusetts respond the same way they did here in LA. New York removes a parking lane to provide space for a protected bike lane and a wider sidewalk. But only for one block. Philadelphia is installing its first parking-protected bike lane, while bike cam video shows why the city’s unprotected two-way cycle track is a bad idea. Eva Longoria is one of us, as she goes for a bike ride with her husband in Miami, dressed in casual clothes. Even if the press does freak out about her lack of a helmet. A pair of Walmart heirs just bought British bikewear maker Rapha for the equivalent of $260 million. No irony here. A London town council promotes a car-sharing program that allows drivers to drop off the cars anywhere, just days after impounding bikeshare bikes for doing exactly the same thing. The world’s biggest bike parking garage just opened in the Netherlands; when finished, it will provide parking for up to 12,500 bicycles. Let the Cycling Yogis be your guide the next time you’re riding in Madras, India. The new government in India’s Uttar Pradesh is trying to rip out cycle tracks installed by the previous administration, blaming them for increasing traffic congestion. Although it doesn’t help that a bicycle is the ballot symbol of the outgoing political party. Maybe not the best time to go for a bike ride after you just escaped from prison a few days earlier. If you have to steal a package off a woman’s porch while walking your bicycle, try not to take the cremated ashes of her dead Yorkie. And lots of people flip over pro cycling. Things got ugly in Koreatown Thursday night. In a violent confrontation only partially caught on video, a swarm of people on a group bike ride pulled the driver of a BMW out of his car at 6th and Hobart in Koreatown. And forcibly pinned him to the street, holding him down until police arrived. The video begins with the riders breaking the window of the BMW as the car’s trunk is already open, then shows several riders milling around as the driver appears to shout from his prone position on the street. The LA Times fills in some of the missing details. Apparently a group of roughly 50 people were riding their bikes through the Koreatown intersection when the traffic light changed. Rather than split the group, one or more riders tried to cork the intersection, blocking the drivers who had the green light. The driver of the BMW attempted to go through the intersection anyway, and got into a shouting match with the rider blocking traffic. When the rider tried to grab the driver, he responded by stepping on the gas, plowing into the group and running over a bicyclist’s leg. The driver then reportedly attempted to flee, but the riders in the group swarmed his car to keep him from leaving. That’s where the video appears to begin. While corking may be a common practice, it’s still illegal, even though police usually look the other way. 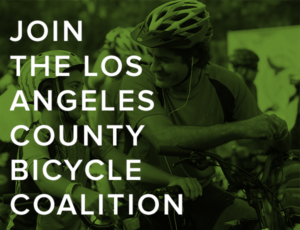 But as BikinginLA sponsor Josh Cohen points out, the driver could — and perhaps should — be charged with assault with a deadly weapon for aggressively driving into the group of riders. Although chances are, he may have claimed he was only get away because he was frightened by the cyclists swarming his car. As LAPD officers have explained similar situations to me in the past, however, the bicyclists may have crossed over the line the moment they broke the driver’s window. Had they merely surrounded the driver’s car, they would have been within their rights to keep him from fleeing. Or they could have taken down his license number and let him leave, likely leading to a charge of felony hit-and-run. But by damaging his car, and physically assaulting him by dragging him out of it and forcing him to the street, they’ve left themselves open to the possibility of criminal charges, as well as a civil suit for the damage to his car and any injuries he may have suffered. Although both sides may have lucked out, since KCBS-2 reports that no one was ticketed or arrested at the scene. Investigators may just wash their hands of the whole ugly mess, concluding that they both contributed to the confrontation. Since the video only shows the second half of the incident, though, and not the driver’s actions that led up to it, it will only serve as fodder for the people who already think we’re all a bunch of lawless thugs. And seem pathologically incapable of separating the actions of a few from everyone else who travels on two wheels. This looks like a case where no one wins. Least of all the rest of us who had nothing to do with it, but may ultimately bear the burden anyway. The family of fallen bicyclist John Bacon have filed a lawsuit alleging the driver who took his life did it on purpose. 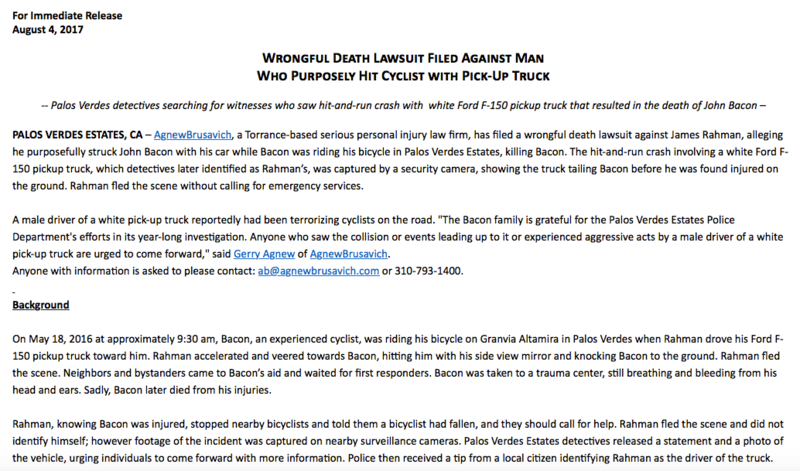 Bacon was headed back home from a group ride last May when the 68-year old man was run down from behind in Palos Verdes Estates by the driver of a white pickup truck. The driver fled the scene after stopping briefly and calling for someone to call 911. The driver, later identified as James Rahman, was caught on security video following Bacon’s bike at an uncomfortably close distance. The suit alleges Rahman honked at Bacon before swerving at him and striking him with the wing mirror of his truck. However, no charges were ever filed, and no details of what happened were ever released. In fact, Cycling in the South Bay’s Seth Davidson has alleged that the local police never took the case seriously. It took an alert cyclist to spot the truck days later, and even then couldn’t get the police to respond. He’s also written that several other bike riders in the area had reported being harassed by the driver of a truck that matched the description of Rahman’s truck. But again, crickets from the cops. Even though, if this lawsuit is correct, this wasn’t hit-and-run. Update: I have been contacted by Joan Bacon, John Bacon’s wife, who wants to correct the information above indicating a lack of concern on the part of the Palos Verdes Police Department. I want to be very clear that I and my family are very grateful to Palos Verdes Estates Police Department and in particular to Detective Hellinga and Detective Reed for their year-long effort and hundreds of hours put into the investigation of John’s death… The Police Department kept me informed along the way, were very gracious and kind and I know did a great job. It is also important that you know the decision to not prosecute the offending driver involved in the crash was not the decision of the Palos Verdes Police Department but rather a decision made by the District Attorney’s Office. You can read the full press release from the family’s attorney below. Needless to say, readers responded to the LA Times’ recent hard-hitting editorial criticizing opponents of street safety projects by insisting they’re not selfish, and they really do care about safety. And is anyone really surprised that the incredibly ugly comments to LA’s new video explaining the need for Vision Zero paint it as nothing more than propaganda and alternative facts? Because actually taking it seriously would require caring about the lives of others, and placing someone else’s safety above their own convenience. Which apparently is a bridge too far for some people. Especially this guy, who’s willing to consider the lives of others, as long as it doesn’t cost him more than four minutes out of his commute. Spoiler alert: If you still have the Tour of Utah on your viewing list, skip the last line of this section. Marianne Vos won her third European road cycling championship. 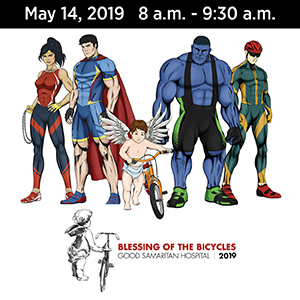 A Colorado Springs CO newspaper examines the inaugural Colorado Classic beginning this Thursday, looking at both the men’s four-stage race and the women’s two stages. US anti-doping officials remind Lance Armstrong that he’s been banned from cycling. And that could extend to his podcast if organizers of the Colorado Classic pick up his tab for covering the race. Twenty-two-year old American pro Tyler Williams is hoping to rise to WorldTour status along with his Israel Cycling Academy squad. Canadian pro Rob Britten held on to win the Tour of Utah after leading since the individual time trial in stage three. A new rendering offers a flyover — and under — of the new Sixth Street Bridge scheduled to open in three years. Although that still looks like a steep climb up the spiral bike and pedestrian ramp. The Ovarian Psychos annual Clitoral Mass ride was transformed into a Black Mass to protest gentrification in Los Angeles this past Saturday. A man in his 30s was critically injured in a collision while riding his bicycle at Walnut Street and North Wilson Ave in Pasadena Saturday evening; as of Sunday morning, he was in stable condition. The 74-year old driver remained at the scene. Hermosa Beach celebrated the 50th anniversary of its sister city program with a bike ride along the beach for middle school students from Hermosa Beach and Loreto, Mexico. A young boy was dragged by a car while riding his bike through a Huntington Beach apartment complex Sunday morning. More proof that kids need safe places to ride their bicycles. A Chula Vista mom turns detective to track down the hit-and-run driver who gave her bike-riding son a fake name and address after crashing into him. San Diego officials accept most of the recommendations in the ambitious plan presented by the city’s Bicycle Advisory Committee, agreeing with 25 of the 32 proposals. A former BMX champ is rebuilding his life after addiction and prison, and helping at-risk Fresno middle school students pedal their way to a better attitude. A ten-year old Washington kid credits his new Mohawk-style helmet with saving his life in a crash. Colorado land managers are struggling to deal with ebikes on mountain trails, where they are often banned — and easy to spot, since they go uphill faster than non-motorized riders. A writer drives 1,000 miles to ride the legendary singletrack on the 100-mile Maah Daah Hey Trail in North Dakota. The war on bikes continues, as a Denton TX driver apparently gets away with brake-checking a bicyclist. Houston police promise to start enforcing the city’s three-foot passing law after writing less than three dozen tickets in 30 months. Maybe we can get them to come up here and enforce California’s three-foot law, since no one here seems to want to do it. When a bighearted Michigan kid won a new mountain bike, he turned around and gave it to someone who needed it more. A Staten Island website says don’t bother with Vision Zero, because bicycling fatalities have remained stable in recent years, despite a dramatic increase in ridership. And because bike riders break the law. Illegal rental bike vendors are hustling tourists away from the only legal bicycle vendor in New York’s Central Park. A new 20-year study from New York confirms the safety in numbers theory, clearly showing that safety improves as more bike riders take to the streets. A North Carolina writer says yes, he screwed up while he was driving, but a pair of cyclists didn’t help their cause by swearing at him. On the other hand, he left crossed a father riding a bike with his kid in the child seat, and undoubtedly scared the crap out him; Mother Theresa would probably have a hard time keeping her cool under those circumstances. Macon, Georgia’s six mile long pop-up bike lane network has been honored with an Excellence Award from New York’s Center for Active Design; the project resulted in a ten-fold increase in people riding to work or school. Ottawa, Canada solves the problem of whether bicyclists can ride in the crosswalk by installing a bike crossing right next the crosswalk on a dangerous intersection. Speaking of Ottawa, the city has discovered they can save $41 per meter — a little more than three feet — by building cycle tracks next to new roadways, rather than painting bike lanes on the streets. London has already removed 130 dockless bikeshare bikes from the city’s streets for blocking sidewalks. Maybe it’s just me, but using the term “yellow plague” — or even “yellow bike plague — seems pretty damn tone deaf in reference to a Chinese company, even if that’s the color of the bikes. A UK writer says it’s just politics, not geography, tradition or cost, that prevents cycling becoming a key transport mode. And that bicycling needs to be a key part of the Labour party’s transportation policy. Sometimes the punishment really does fit the crime. After an English boy is caught on video trashing a bikeshare bike, he’s sentenced to learn how to fix it. Caught on video: After a British bike rider was hit by a car, he responded by repeatedly punching the driver through an open window; the man who filmed it said he’d never seen anything so violent. That’s the fastest way to go from victim to criminal. So don’t do that. Ever. E-mountain bikes are bringing France’s spectacular Vercors Massif mountain range into reach of average riders. Beirut bicyclists are trying to revive cycling in what might be one of the world’s most bike-unfriendly cities. A 186-mile supported bike tour through bad roads from Sierra Leone to Liberia is changing lives. Not surprisingly, fines for scofflaw cyclists have surged in Australia’s New South Wales in the first year after instituting draconian fines for relatively minor offenses, including a jump from $337,000 to $1.99 million for not wearing a helmet. A new ride aims at promoting unity among Malaysians, as many young people seem to have lost faith in the county. Japanese bike riders can pump up their tires with free bike pumps at any police box. A Thai website looks at the world’s longest elevated bikeway in Xiamen, China. Probably not the best idea to steal a bicycle from the grounds of the Russian embassy. It might not be the smartest move to call the police to say you’re being followed, if the person following you is the father of the kid whose bike you just stole. And if you’re going to flee from police after running a stop sign, make sure the cyclist you end up crashing into isn’t an off-duty cop. A manhunt is on in San Bernardino County after a bicyclist was killed in what police describe as an intentional attack. According to the Desert Dispatch, 40-year old Barstow resident Bennett Warner was riding his bike westbound on Main Street around 12:53 pm Monday when he was approached by a man identified as 22-year old Raymundo Alberto Rodriguez-Cordova of Barstow. The two men got into an argument, after which Warner rode into a parking lot on the 1000 block of Main. Cordova followed Warner in his pickup and accelerated into Warner, slamming him into a parked car. Cordova fled the scene following the crash, leaving Warner to die later of his injuries. There’s no word on what the two argued about, whether it had to do with road rage or a personal dispute between the two men. Police are looking for an older model pickup, possibly a 1993 Chevy S10, black with red or primer markings on the front, Kansas plate 180GRS. Anyone with information is urged to call Detective Tom Lewis at 760/255-5187. This is the 22nd bicycling fatality in Southern California this year, and the third in San Bernardino County. My deepest sympathy and prayers for Bennett Warner and all his loved ones.